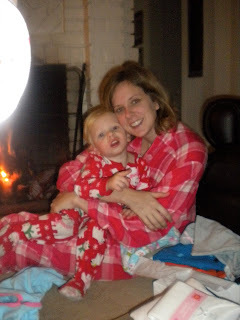 Krazy Krouse Kids: Merry Christmas! Santa found 156 Maple Street, that's for sure! I woke the kids up around 7:45 so they could get up and see what Santa brought them. Caroline informed me that "Santa did not come to our house." We had a conversation about this for about 5 minutes when I finally convinced her to just come and look to see if there was a pink princess dress waiting for her. I carried Tucker into the living room with his head on my shoulder because he was still sleepy. 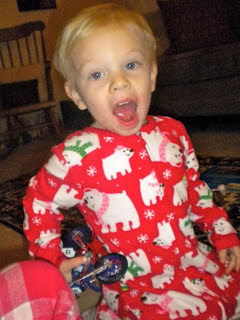 As soon as he saw the matchbox cars, dump truck and motorcycle, he was ready to get down. Caroline immediately saw the princess dress and said "Oh wow!" She then began to point out all of Tucker's new toys to him. Tucker was way ahead of her and did not need a guide! I think her favorite thing was the collection of beads in small pink containers for her to sort. She said "Mommy, it's beads like you have!" Tucker began loading all his matchbox cars into the dumptruck and wheeled it around. It has definitely been a Merry Christmas at Brown House!